In this blog post, I will share experiences from a cross-regional migration of large-scale NoSQL database clusters (from Europe to the U.S.). The migration was a joint project implemented by the Ops team of our reference customer, FunCorp, and AWS Solutions Architects. If you’ve ever asked yourself the question, “Why migrate everything?” consider FunCorp’s reason: In the beginning, FunCorp selected an AWS region based on the Russian market, but the iFunny app quickly gained enormous popularity in the United States. Up to a certain point, it was convenient to have a backend located on a different continent. However, the high networking latency began to affect the user experience. For this reason, a migration became one of the integral parts of FunCorp’s global UX improvement program. At first, we planned to implement the migration project using own capabilities for geo-distributed replication for each mentioned database (Cassandra, MongoDB, Amazon ElasticSearch Service, and Redis), but we faced several significant problems unique to each database. 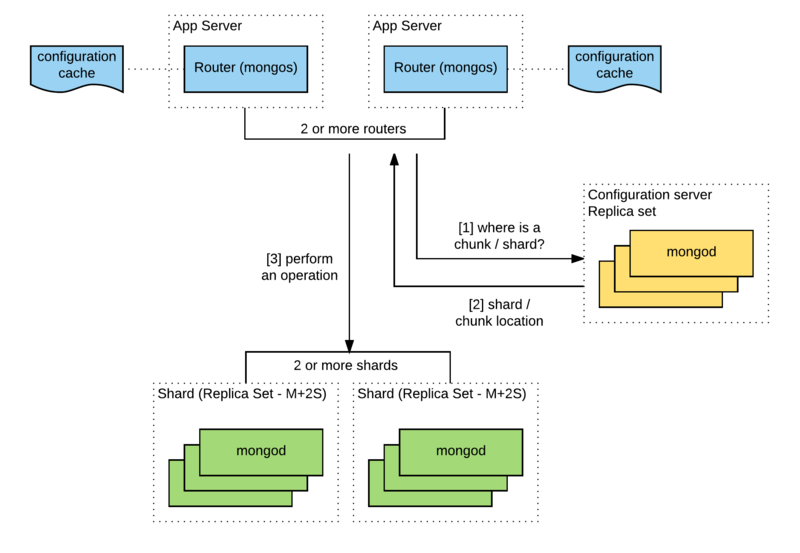 The first issue had to do with mongos for MongoDB Shard, a routing service for shard configurations. The replication between the European cluster and the USA cluster ran smoothly and was implemented by using the standard features of MongoDB, but after switching the users to a new back-end MongoDB, the performance of mongos in the U.S. decreased considerably. The problem was that a geo-distributed cluster of MongoDB supported only one set of configuration servers, which were located in Europe at the time. The following diagram illustrates the initial setup. Mongos had to call the configuration servers, which were located overseas, for virtually every operation. The good news is that mongos keeps its configuration cached. However, it’s not possible to increase the number of chunks or to reorganize the data between them by relying only on caches and without connecting to the configuration servers. Therefore, the server migration should have been done quickly. We created some instances in the target region beforehand, with a configuration identical to the current one, and then we incorporated them into the existing replica set of the initial clusters. Then we waited until the end of the data replication. Just before the start of the migration process, we switched off mongos balancing. Thus, the mongos processes in the target region used a cached version of the configuration. During the migration, we moved away all of the instances with the data in the source region, one by one. In the replica set, there were only instances in the target region left, and new primary servers were elected from among these. Finally, we migrated the replica set configuration to the new region. To migrate the Cassandra clusters, we created an additional Cassandra data center in a Cassandra geo-distributed cluster with a standard EC2Snitch in the target region and connected them to existing clusters through a software VPN tunnel. After that, we started the nodes and began the replication process. The VPN tunnel was essential, because it allowed us to enable interactions between geo-distributed clusters without having to change the snitch from EC2Snitch to EC2MultiRegionalSnitch. In our case, that meant not only a change of the snitch itself, but also manual cluster scaling, support for address lists in security groups, interaction between nodes on a public IP, and many other things. We thought most of the problems were solved. Unfortunately, just after we started the replication process, the performance of the original Cassandra cluster dropped significantly. The problem was that Cassandra started replicating data to the new DC simultaneously, from all of the nodes in the source region to all of the nodes in the destination region, with respect to our replication factor and level of consistency. To solve the problem of performance degradation, we stopped the clusters’ replication processes and started rebuilding the nodes of the target cluster, piece by piece, two to three nodes at a time. By taking this approach, we replicated both clusters without interrupting the work process and with almost no significant performance degradation. After the replication process was complete, we were able to repair all of the nodes in the target cluster. After that, we switched the applications from the source DC to the new DC. Finally, we excluded the source DC from the cluster, and then terminated that DC. We took a similar approach for the Redis migration. We created some new clusters, connected them to the existing one in the source region, and then started replication. The volume of data to be migrated was not a factor, but the data was changing at a very high speed. As a result, the data failed to be replicated within the time defined by the cluster replication window, and all of the data in the target cluster was invalidated. Done! Now the Redis replication was running successfully. Because of compression, the replication lag did not increase and never approached a critical threshold in the replication window. Our initial plan was to avoid the migration of the ElasticSearch search index and to instead re-create it in the destination region. Unfortunately, the procedure of index creation was too complicated. It required engagement from our development teams, which was outside the constraints and conditions of the project. Creating an ElasticSearch cluster in a destination region. Creating an Amazon S3 bucket, with versioning and cross-region replication enabled. Creating a snapshot of the main data set and writing it to S3. The snapshot was transferred to the new region automatically. Restoring data from the snapshot in the target region. The project was successfully implemented and the back-end migration reduced latency by at least 40% for end-users when accessing the iFunny mobile back-end API. However, it took us more than two months of experimenting and a month and a half for an actual migration. Any database migration is a complex process. Ambiguous situations, such as the non-standard behavior of a database engines or a process that places a significant impact on the network, can always occur. The best and safest way to migrate, free of data loss or similar surprises, is to test with real data and real configurations – and only afterward, to proceed with transferring the production database to a new location. Even if your application is not cloud-native, the use of cloud services allows you to experiment and to reproduce the existing use case in a geographically distributed environment, at real scale of clusters and data.